USN lead the way in the supplement market with the introduction of their new Creatine Ethyl Esther (CEE) formula - Creatine X4. A breakthrough in creatine supplementation! CreatineX4 provides a revolutionary form of creatine which does not rely on insulin driven absorption. The benefit of this is that a smaller amount of creatine is required (it is now possible to supply sufficient amounts in convenient caplets), and the creatine is absorbed rapidly and retained. The benefits of creatine supplementation, when combined with weight training have been exhaustively researched. Sci-Mx now offers the increased benefits of creatine ethyl ester in convenient, easy to swallow caplets. Free form amino acids in the form of taurine, beta-alanine and glycine are added to make USN's CreatineX4 an incredibly powerful package. Creatine Ethyl Ester HCL is a fat soluble form of creatine which penetrates muscle cells at a rapid rate. This allows muscle ATP (energy) to regenerate much faster, thereby allowing for extremely fast muscle recovery during workouts. Muscle cells can function at maximum efficiency throughout the workout. Each serving also provides 1000mg of Glycine which is an amino acid that prevents muscle degeneration by supplying additional creatine. It also helps repair damaged muscle tissue. Beta Alanine is added to the formulation as it plays a major role in the transfer of both nitrogen and nutrients. Studies report that the increase of creatine levels may help delay the onset of fatigue, increase energy metabolism in the muscle cells and enhance the body's overall training capability. Creatine serves as a high-energy bond in muscle and nerve tissues for maintenance of ATP levels during muscular contraction. 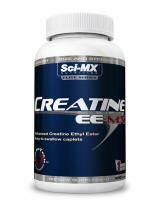 The power provided by CreatineX4 is unmatched in its ability to boost your muscle training intensity and endurance. Creatine supplementation has proven to buffer lactic acid build up, and enhance muscle recovery during training. CreatineX4 is the new generation creatine that will dramatically enhance performance, growth and recovery! Take 4 caplets with a glass of water 30 minutes before a workout. On non-training days take 4 caplets on an empty stomach first thing in the morning. Drink 2 to 3 litres of water a day when using this product.